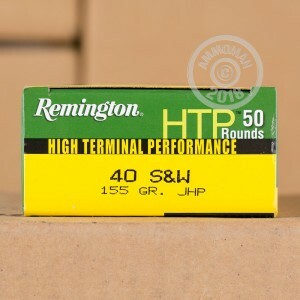 This Remington HTP ammunition delivers effective self-defense at a reasonable cost for owners over .40 S&W ammunition. 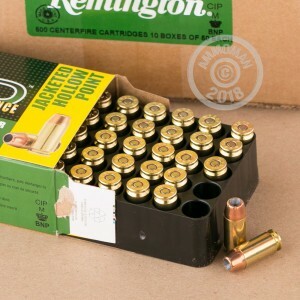 Manufactured in Lonoke, Arkansas, these cartridges come in convenient, economical 50 round boxes. Each round fires a light 155 grain jacketed hollow point at an above average muzzle velocity of about 1,205 feet per second. This combination allows the round to take advantage of its high caliber while delivering high levels of penetration and expansion. 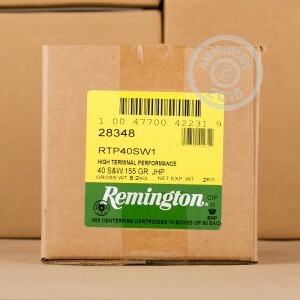 Remington HTP ammo uses non-corrosive Boxer primers and brass cases. It's priced to allow you to train with what you carry, so grab a few boxes. Even better, spend more than $99 at AmmoMan.com in a single order and get free shipping!